I'm not going to lie I'm a sucker for a beauty product with pretty packaging and when I first saw Yves Saint Laurent had released a new perfume called Black Opium, I was instantly drawn in with the beautiful glittery bottle. After popping into my local Boots just before Christmas, I fell in love with scent and quickly added it to my wish list. Being a very lucky girl I got it for Christmas and I'm surprised it has lasted as long as it has! I've probably got about a quarter left now and I'm trying to drag it out until Christmas, when I can add another perfume to my wish list. Before last Christmas, I hadn't tried any Yves Saint Laurent perfumes and boy was I missing out! I recently also got their new 'Mon Paris' perfume for my birthday and it is amazing. Going back on topic, as said before I got the Black Opium Eau De Toilette for Christmas, not to be confused with the Eau De Parfum. I was a little bit dubious of the Black Opium Eau De Toilette before I had smelt it in the shop, as one of the base notes is coffee and I could not think of anything stranger to be in a perfume especially since I cannot stand coffee. Whilst I did think it was weird at first I can safely say I am definitely a fan now, I cannot smell a single hint of coffee as it is deeply buried by the oriental floral and fruity notes. 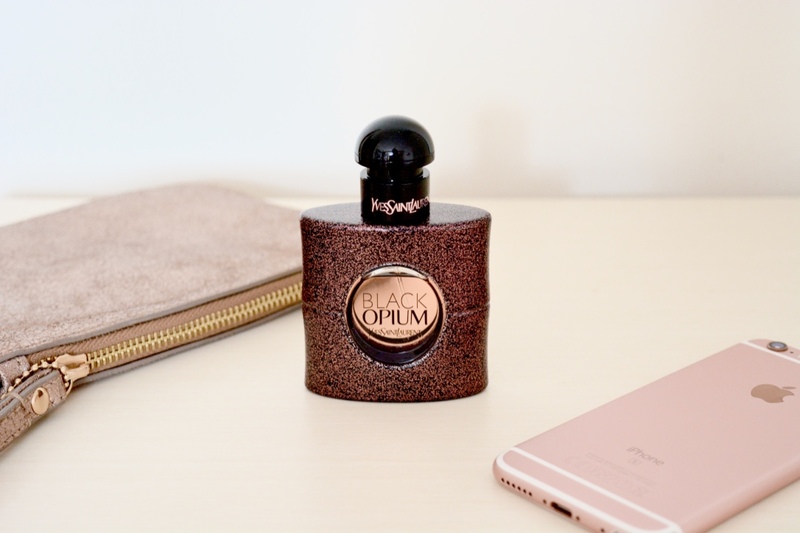 It is the perfect fragrance for a night out and the glam bottle means it will fit right in your clutch bag. Containing top notes of Blackcurrant Accord, Pear Accord, Green Mandarin Essence, heart notes of Jasmine Tea, Orrange Blossom, Floral Solar accord, and base notes of Coffee Accord, White Musks and Blond Woods. This oriental floral fruity perfume has a strong kick to it, that lasts all day and smells just as good in the evening as to when I first applied it in the morning. Whilst it is a powerful fragrance, it isn't overpowering in the slightest and is just the right amount of strong. If you love sweet floral/fruity fragrances then you should definitely give this a whirl! It definitely is a winner for me as not only is it a great perfume but it comes in the most adorable and glittery bottle. Yves Saint Laurent have since then recently come out with a Black Opium Nuit Blanche Eau De Parfum and Black Opium Wild Eau De Parfum, which I need to go into Boots to investigate.